Terrorist who stabbed two IDF soldiers located and arrested in joint operation of IDF, police, Border Police, and Shin Bet security agency. The IDF released footage Friday morning from the arrest of the 19-year-old Arab terrorist responsible for the stabbing attack near an army base Thursday afternoon. 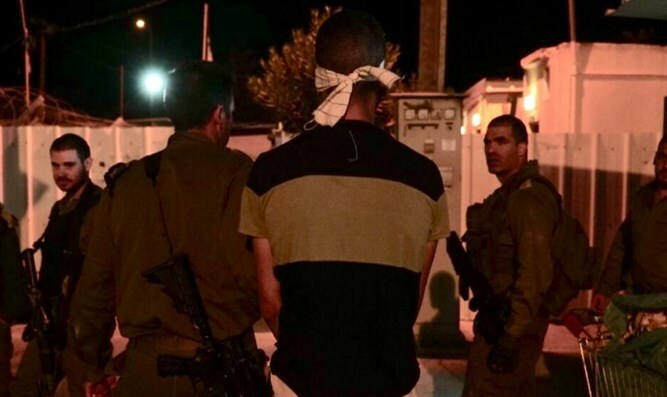 Late Thursday night, Israeli security forces tracked down and captured the 19-year-old terrorist, a resident of the Palestinian Authority village of Jamma'in near Nablus (Shechem). During the attack, the 19-year-old terrorist stabbed a 32-year-old IDF reservist near the Samaria Regional Brigade base. The reservist was evacuated to Beilinson medical center in Petah Tikvah. His condition was defined as moderate-to-serious. Samaria Regional Council head Yossi Dagan congratulated the IDF, the Shin Bet and the Yamam counterterrorism unit of the Border Police on the capture of the terrorist. An IDF spokesperson said security forces were still working to track down the terrorist responsible for the shooting attack earlier this week at the Alon recycling plant in the Barkan industrial zone in Samaria. According to the army, several suspects with ties to the terrorist were taken into custody. In searches overnight, IDF and Border Police discovered an illegal handgun in the village of Ar-Ram south of Ramallah.